When the 99-year British lease on Hong Kong’s New Territories expired, the Crown of the City of London’s Colony was ceded to China. Of hundreds of newspaper stories and TV reports that covered this event, not one revealed how England first gained control of Hong Kong! The truth lies buried in the family line of David Sassoon, “The Rothschilds of The Far East,” and their monopoly over the opium trade. Britain won Hong Kong by launching the opium Wars to give the Sassoons exclusive rights to drug an entire nation! David Sassoon was born in Baghdad, Ottoman Iraq in 1792, son of Saleh Sassoon, a wealthy banker and treasurer to Ahmet Pasha, governor of Baghdad (making him the “court Jew”—a highly influential position). When Ahmet was overthrown for corruption in 1829, the Sassoons fled to Bombay, India, the strategic trade route to India and gateway to the Far East. Soon the British government granted Sassoon “monopoly rights” to the manufacture of cotton goods, silk, and most importantly, Opium—at that time the most addictive drug in the world! British Prime Minister Palmerston wrote Crown Commissiner Captain Charles Elliot that the treaty didn’t go far enough. He said it should have been rejected out of hand because: “After all, our naval power is so strong that we can tell the Emperor what we mean to hold rather than what he would cede. 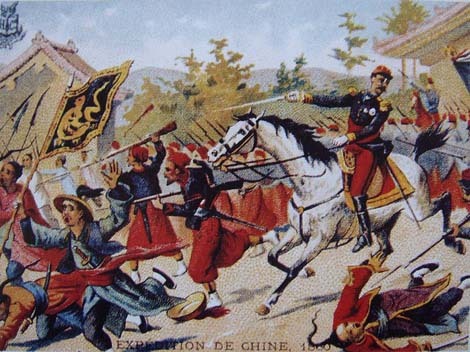 We must demand the admission of opium into interior China as an article of lawful commerce and increase the indemnity payments and British access to several additional Chinese ports.” Thus, China not only had to reimburse Sassoon the value of his dumped opium but to pay England the sum of 21 million pounds for the cost of the war! In October, the British besieged Peking. When the city fell, British commander Lord Elgin, ordered the temples in the city sacked and burned to the ground as a show of contempt. In the new “Peace Treaty” of October 25, 1860, the British were assigned rights to a vastly expanded opium trade covering seven- eights of China, which brought in over 20 million pounds in 1864 alone. In that year, the Sassoons imported 58,681 chests of opium and by 1880 it skyrocketed to 105,508 chests, making the Sassoons the richest Jews in the world. England was given the Hong Kong peninsula as a colony and large sections of Amoy, Canton, Foochow, Ningpo and Shanghai. The Sassoons were now licensing opium dens in each British occupied area with large fees being collected by their Jewish agents. Sassoon would not allow any other race to engage in “the Jews’ business”. Sir Albert Sassoon, the eldest of David Sassoon’s sons took over the family empire, constructing huge textile mills in Bombay where he paid slave labor wages. This expansion continued after World War One, putting England’s mills in Lancashire out of business. Thousands lost their jobs. This did not deter Queen Victoria from knighting Albert Sassoon in 1872. Franklin D. Roosevelt’s fortune was inherited from his maternal grandfather Warren Delano. In 1830 he was a senior partner of Russell & Company whose merchant fleet carried Sassoon’s opium to China and returned with tea. Warren Delano moved to Newburgh, N.Y. In 1851 his daughter Sara married well-born neighbor, James Roosevelt—the father of Franklin Delano Roosevelt. Although he knew the origin of the family fortune, he refused to discuss it. The Sassoon opium trade brought death and destruction to millions and still plagues Asia to this day. Their company was totally operated by Jews ONLY! The corrupt Khazar British monarchy honored them and although history describes them as the “great developers” of India, the source of their vast wealth is never mentioned!